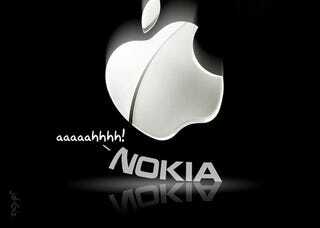 First Nokia sued Apple. Then Apple sued Nokia. Last week, Nokia went to the International Trade Commission and requested a ban on the import of infringing Apple products. Today, Apple asked ITC to ban the import of infringing Nokia products. This game of patent-infringement ping pong dates back to October, when Nokia first sued Apple for violating 10 patents, including holdings related to GSM, UMTS and wireless LAN. About a month and a half later, Apple countersued, claiming that Nokia was attempting to steal their technology. Since then, both sides have filed further lawsuits claiming further patent violations of various sorts. This week, the squabble's stage has moved to the International Trade Commission. A few days ago, Nokia requested that the ITC ban the importing of any and all Apple products, from MacBooks to iPhones, that make use of the patents in question. Today, Apple fired back, requesting the same ban on Nokia's mobile phone imports.